Sold by Ciscle AU and Fulfilled by Amazon. Gift-wrap available. 100% Compatible with all capacities touch screen devices. Compatible with Apple iPod, iPad, iPhone, Samsung Galaxy phones and tablets & more. Laptops, tablets, phones, or any touch devices, one stylus to rule them all. Just like a pen, but with a round disc on the end. The clear disc allows you to pinpoint exactly where the tip is placed on the screen. The tip itself is like the fine tip of a very sharp pencil so ideal for making precise drawings. Tablets are used for so many things nowadays and this includes drawings and plans. No matter how fine a tip you try of the standard fibre or rubber tips they are just not fine enough or precise enough for some uses. These precision tips provide that accuracy. -Comes combinations of various colors, fashion design, made of aluminium and steel. 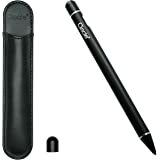 -Good pen-like length of the stylus and balanced weighting allow for much more natural control. -This also prevents smearing the screen with oils and dirt from your fingers. 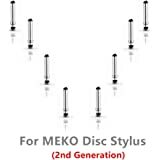 -This transparent disc gives you a very clear view of the stylus point. It means that you can be very accurate with your fine-line drawing, as well being able to click on a very specific spot on the screen. 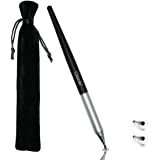 -The pen tips allow up to a 75-degree angle when in use and work seamlessly with the devices. -The tips are interchangeable when they start to wear out, they can be screwed and unscrewed easily. -Very sturdy and having replaceable tips is extremely convenient. Cuts down on waste/money. The Stylus is 100% compatible with all capacitive touchscreen devices; iPhone X, 8/ 8 Plus, 7/ 7 Plus, 6/ 6S, 6 Plus/ 6S Plus, 5/ 5S, 4/ 4S, iPad, iPod, Samsung Galaxy S6, S5, S4, S3, Note5, Note4, Note3, LG, Motorola, Sony, iOS android or other tablets and phones. 5.0 out of 5 starsI Recommend this Stylus! Great product in my opinion. The stylus performs as good as advertised. They even comewith replacement tips and the opposite side of the tip is in itself a stylus as well though much less precise. I enjoy my purchase very much. These styluses are amazing. They look super professional and are way better than those microfiber styluses. It feels as though you’re writing with a pen on your iPad. 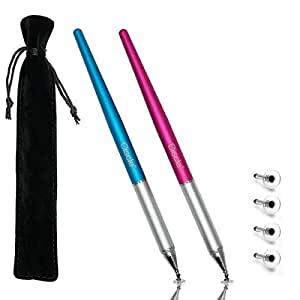 It brings a pouch to hold the styluses and four replacement tips, also you can twist off the pink or blue part of stylus and flip the silver part over and put the tip into the pink part and the stylus closes so you don’t damage the point of the stylus. Really great product, should highly recommend for those who like to hand write on notability, graphic designers or artists should like to draw or just any use where youve been using your finger too much and it’s blistering or hurting. Must have tool for FIRE HD for me. Makes scrolling possible with far fewer "touch to swipe but not activate" mistakes. I'd bought some similar styluses from another seller, but when dropped, the mesh end gradually broke loose preventing the cap from going back on. so this time I looked for just the disc type. I like the weight of these and the fact that they are well made.